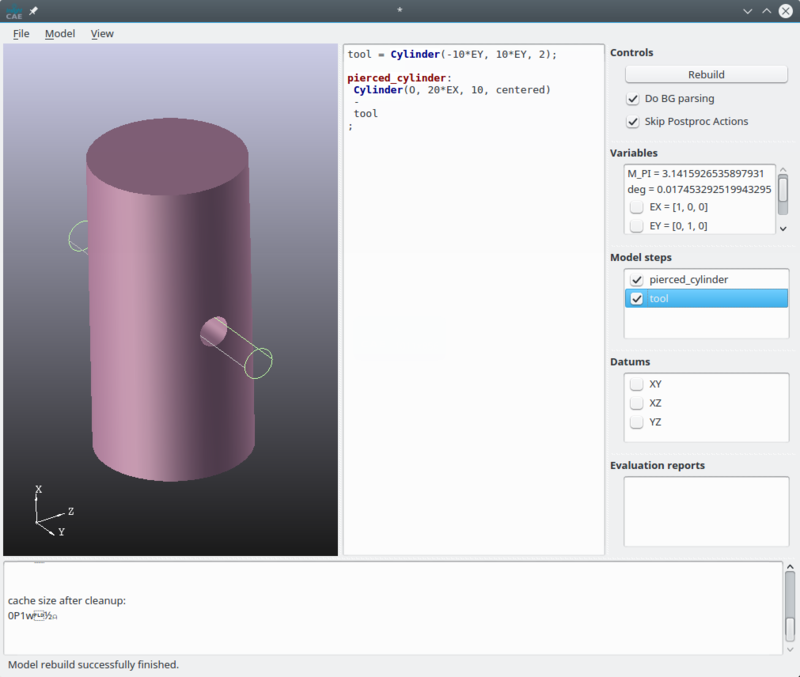 InsightCAD is a script-based tool for creating three-dimensional geometry models. All geometric operations are based on the OpenCASCADE geometry kernel. It uses the boundary representation approach (BREP) for treating the geometry. Thus it is possible to import and export the common exchange formats IGES and STEP. Although the primary intention of InsightCAD is creation of fully parameterized CAD models for systematic numerical simulations, it can also be used for mechanical design purposes. It therefore provides the possibility to export projections and sections of the created models in DXF format for use in drawings. Additionally, there is support for a library of parametric standard parts. There is no explicit type declaration: the data type of each symbol is deduced from the defining expression. Beyond their geometry representation, geometry feature objects are containers for scalar, vector, datum and feature objects. These symbols can be accessed in the model script but are read-only. It is possible to load another model into the current one by the "loadmodel" command (see section "Features"). In this case, the loaded model represents a subassembly, i.e. a compound of features. Since not all defined geometry objects in the submodel may represent assembly components, marking of components is supported by the feature definition syntax and needs to be utilized properly in the definition script of the submodel. 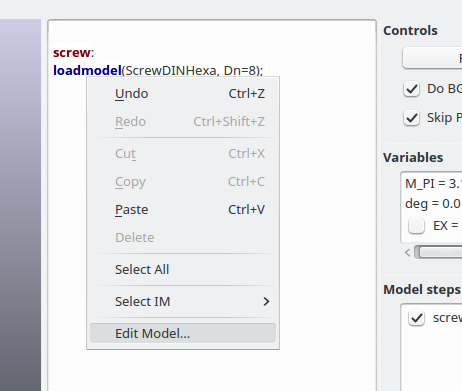 Also, when loading models (subassemblies), parameters can be passed to the submodel. These can be scalars, vectors, datums or features. In a model script, after the definition of the aforementioned symbols, an optional section with postprocessing actions can follow. These can be e.g. file export, drawing export or others. Comments are lines starting with "#" or text regions enclosed by "/*" and "*/" (C-style). The "?=" operator assigns a default value. This needs to be used for symbols which are intended to be used as parameters in the "loadmodel" feature command. Symbols defined by the equal sign operator ("=") cannot be overridden during the loadmodel command. Supported operations are listed in the following table. There are scalars predefined in each model. They are listed in the following table. Supported operations are listed in the table below. There are vectors predefined in each model. They are listed in the table below. Some simple examples are given below. <feature>%<identifier> Access datum inside another feature. Plane(<vector:p0>, <vector:n>) Datum plane with origin p0 and normal n.
SPlane(<vector:p0>, <vector:n>, <vector:e_up>) Additionally, the y-direction of the plane CS is aligned with e_up. RefAxis(<vector:p0>, <vector:e_x>) Axis with origin p0 and direction e_x. A very simple example is given below. It consists of two primitive features (cylinder) and a boolean operation (subtraction). Geometry symbols can be defined by a "=" or a ":" operator. The difference comes from a possible use of the model as a subassembly later on. Since usually not all defined features in a model are assembly components but some are only intermediate modeling steps, there are these two syntaxes for defining a feature with a subtle difference: "<identifier> = <expression>;" defines an intermediate feature while "<identifier>: <expression>;" does the same geometry operation but marks the result as being an assembly component. 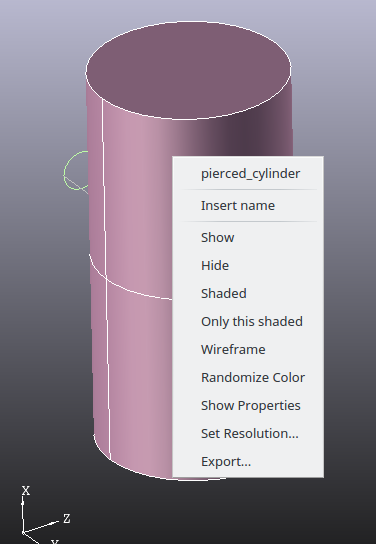 In the above example, only the feature "pierced_cylinder" is marked as a component. Thus if the above example would be loaded as a subassembly, only the "pierced_cylinder" will be shown and included in e.g. mass calculations. In this section, an incomplete subset of the avilable feature commands is described in detail. For a complete list, please refer to the online documentation in the iscad editor (press Ctrl+F). Transformation of feature f. Translation by vector delta and rotation around axis vector phi (magnitude of phi gives rotation angle). Places the feature f in a new coordinate system. The new origin is at point p_0, the new x-axis along vector e_x and the new z-direction is e_z. Imports solid geometry from a file. The format is recognized from the filename extension. Supported formats are IGS, STP, BREP. Reads a sketch (i.e. a closed contur) from a file. The geometry in the sketch is expected to be in the X-Y-Plane. It is placed on the given plane pl. Sketch file format is recognized from the file name extension. 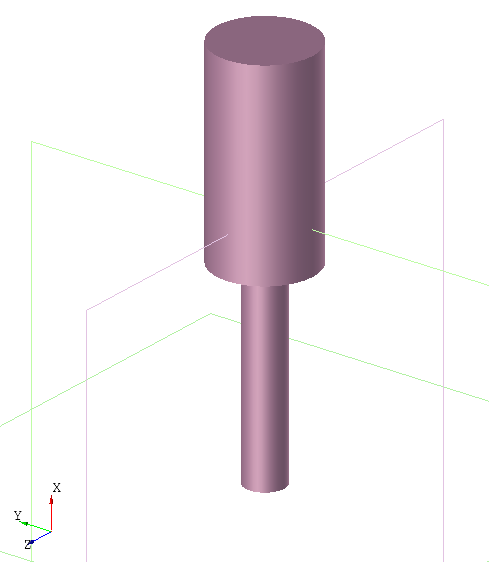 Supported are ".dxf" and ".fcstd" (FreeCAD). The name is interpreted as layer name in DXF and sketch name in FreeCAD files. For FreeCAD sketches, a list of parameter values can optionally be supplied. 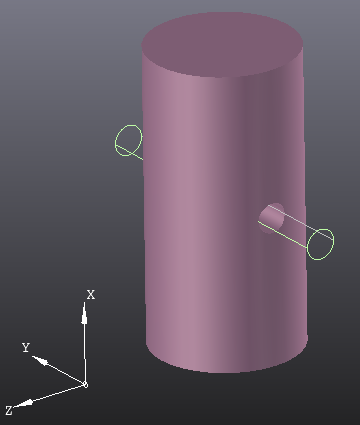 Upon loading, the sketch will be regenerated through FreeCAD with these values. Parses another InsightCAD model (submodel) and inserts a compound of all features into the current model, which were marked as components in the submodel (i.e. which were defined with the colon ":" operator instead of the equal sign "=" in the submodel). Optionally, a list of symbols is inserted into the namespace of the submodel (additional optional parameters). There are commands for creation of several different geometrical primitives, e.g. Extrude the feature f with direction and length vector L. When the keyword "centered" is given, the extrusion is centered around f.
Creates a revolution of the planar feature f. The rotation axis is specified by origin point p_0 and the direction vector axis. Revolution angle is specified by phi. By giving the keyword "centered", the revolution is created symmetrically around the base feature. There are more features available. A comprehensive list is obtained by pressing Ctrl+F in the iscad editor. It is possible to supply additional arguments to the selection expression, like scalars, vectors or features. The selection command string contains rules for the selection. Finally, the command string is evaluated as a boolean expression comprising comparison operators, boolean operators and query functions. Within these boolean expressions, quantity functions can be used. The available set of query functions and quantity functions depends on the type of shape which shall be queried. It defines a view on the point vector p_0 with normal direction vector n of the view plane. The upward direction (Y-direction) is aligned with vector e_up. The keyword "section" toggles whether only the outline is projected or if the view plane creates a section through the geometry. If keyword "poly" is given, the DXF geometry will be discretized. This is more robust but creates much larger DXF files. Keyword "skiphl" toggles whether hidden lines are output. The keyword "add" followed by the key letters l, r, t, b and/or k enables creation of additional projections from the left, right, top, bottom and/or back, respectively. 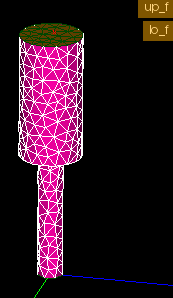 Generates a (triangular or tetrahedral) mesh for an FEA analysis of the feature f. Gmsh is used as a meshing backend. The mesh format is determined by the outputfile extension (.med = MED format). The label of the mesh is set to l.
The general mesh size is set by Lmax and Lmin. The optional keyword "linear" switch from quadratic to linear elements. Named groups of vertices, edges and faces can be created using the keywords "vertexGroups", "edgeGroups" and "faceGroups" repectively. Each group definition takes the form "groupname" = "selection set" (see section "Lower dimensional shape selection" for definition of selection sets). Optionally, a mesh size can be assigned to each defined group by appending an @ sign followed by a scalar value. ISCAD is a graphical editor for InsightCAD scripts. It consists of a text editor for editing the script contents and a 3D view and some other elements for inspecting the resulting model. A screenshot is shown in the figure below. The model script is entered into the text editor widget right of the 3D display. Once a script shall be evaluated, it can be parsed by clicking in the button "Rebuild" or pressing Ctrl+Return. A list of all created feature symbols in the "Model Steps" list box. If the check box is checked, the 3D geometry is displayed in the 3D view. The values of all scalars and vectors in the "Variables" list box. For each vector variable, a check box is displayed. If it is checked, the vector is interpreted as a point location and the point is shown in the 3D display window. All defined datums are listed in the "Datums" list box. Again, the check box controls, whether the datum is displayed in the 3D view. When hoovering the mouse pointer over a displayed feature in the 3D geometry window, it is highlighted. The highlighted feature is the one, which would be selected during subsequent mouse clicks. When the left mouse button is pressed, the highlighted feature is selected and all its contained reference points are displayed. When the right mouse button is pressed, a context menu for the selected feature is displayed. The first entry is the feature name. When it is selected, the definition in the script editor is highlighted and the cursor jumps to it. 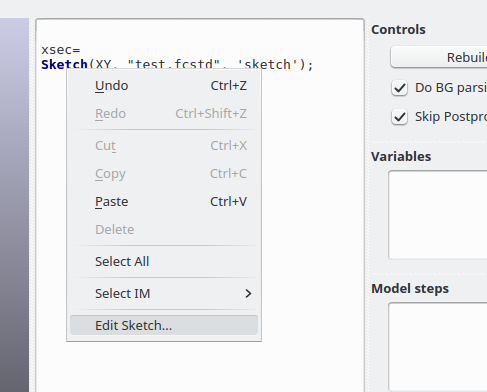 When selecting the "Edit Sketch..." entry, FreeCAD is launched and the sketch editor opened. If the FreeCAD-file or sketch inside it is not yet existing, they are created. When selecting the "Edit Model..." entry, another instance of iscad is launched with the specified model script loaded.